A few weeks ago, we posted a number of reviews of DVDs featuring the Peanuts gang, but I had one more in the hopper that I’d been holding off on posting until we needed to fill some space during the holidays. I meant to post it earlier, but better late than never, especially since our “Best Of 2008” feature has been delayed until ol’ Ben gets himself a new computer to replace his old, regrettably fried, unit. He promises us that the replacement model will be one sweet machine, including Blu-ray capability! Every cloud does indeed have a silver lining. So, here we have a review of yet another Christmas special featuring Charlie Brown and company, the surprisingly good I Want A Dog For Christmas, Charlie Brown. This extra-long special was done in 2003, after Peanuts creator Charles Schulz had already passed away, but the jokes are straight out of the strip and it works out very well. Additionally, there are two shorter specials included as bonuses, specials that were originally made to fill out broadcasts of the classic A Charlie Brown Christmas, including the terrific Making Of A Charlie Brown Christmas, hosted by Whoopi Goldberg, with lots of vintage footage of early Peanuts car commercials and more. This disc came out from Paramount back in 2004; so, with Paramount no longer having the Peanuts home video rights, this disc has been discontinued. BUT it’s well worth trying to find this real gem of a DVD. 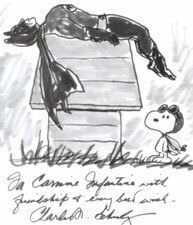 Additionally, I just happened to find what I thought was a pretty darn neat tie-in with our recent review of Batman: The Complete Animated Series, a doodle of Batman and Snoopy – as you can see in our image top right – that was given to comic book illustrator Carmine Infantino by Charles Schulz himself! Is that cool or what?!? Extremely, I say! I found this while reading a book I picked up at Comic-Con in July, a bargain for 5 bucks! To me, this image alone made that purchase worthwhile. From all of us here at Animated News & Views, Happy New Year!!! !– Rand.